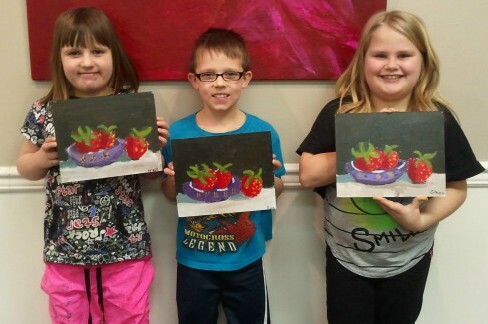 Kids Paint Berries | "A Place for Learning"
The young artists painted a lovely bowl of strawberries in class yesterday. Even though school was canceled because of the snow, these three die-hard artists came to class to learn about shading and shadows. And they applied those principles to these painting with great success. Good job guys!!! Hi – what a nice blog. Lovely pictures! Can you tell a little more about how you did the paintings? Thanks for looking at my blog. With my kids classes I generally draw something for them and they paint along with me as I demonstrate. We work in acrylics.